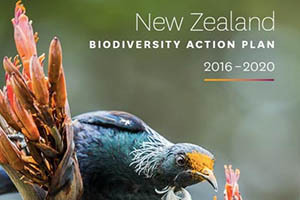 A new action plan setting targets for protection of New Zealand’s unique native animals and environment has been officially released by Conservation Minister Maggie Barry. The updated Action Plan includes Predator Free 2050, the Government’s commitment to ridding New Zealand of rats, stoats and possums – the three biggest invasive threats to our biodiversity. The Action Plan sets out 20 ambitious and measurable national targets. They include expanding landscape-scale predator control to more than 1 million hectares, removal of 500,000 hectares of wilding conifer infestation and expansion of the Healthy Nature, Healthy People programme. “Halting biodiversity decline is a massive challenge, and we need to join forces with others because it is the only way we can achieve our ambitious goals. Collaboration between DOC, other Government agencies, communities, private landowners, iwi, philanthropists and business can make significant gains,” said Hon. Maggie Barry, citing Predator Free 2050, the War on Weeds and the Battle for our Birds, s examples of what is needed to protect New Zealand’s biodiversity.